The Wat Huay Mongkol is a temple with a huge image of the renowned Buddhist monk Luang Phor Tuad who live 400 years ago in Thailand. 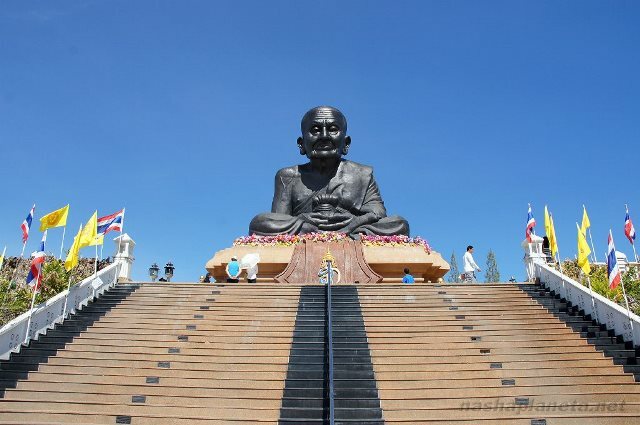 In a large ground of the Moo Baan Village of the Huay Mongkol, previously known as Huay Khot, the temple serves a popular landmark with the statue of the monk looming hundreds of meters away from the site. The temple was historically a part of a Royal project by the King Rama IX. Apparently, in 1952 when the King visited the village, he saw that it was poor and decided to provide agricultural education for the farmers, build new roads, change the village’s name to Huay Mongkol and build the village temple. Then, in 1964 the head of the monastery collected some funds and made the temple building larger. And in 1994, the new head of the monks decided to build a statue of Luang Phor Tuad, which turned out to be a wise decision, raising the status of the temple and making the temple one of the most popular attractions in the area today. The statue was said to have taken 10 years to build. It stands to a total of 11.5 meters high from the base and is 9.9 meters wide. It was presented to the public in an opening ceremony attended by the Queen Sirikit in 2004 coinciding with Her Majesty’s 72nd birthday. There are also other attractions in the temple grounds. There are two large, skillfully carved elephant statues at either side of the massive monk statue. These elephants are quite famous with the locals too because it is believed that walking under the wooden elephants will bring them luck in life. There’s also a sunflower field and a lake that’s ideal for photograph-taking. In addition, if you like elephant-riding, it is possible to have one within the temple complex. The temple is most busy in weekends, when Thai Buddhists pay homage to the statue of Luang Phor Tuad, who was famous for his miracles. Thousands of visitors also visit with hopes of increasing their spiritual merit. If you decide to visit, it would be best to go in the morning as the climb up the steps leading to the statue can be a bit difficult and the heat of the day would add strain to your climb. It is easy to get to the Wat Huay Mongkol. It is, however, a bit far, so it’s best to ride a taxi if you don’t have a rental. It is also fine to go by motor taxis. Just head west from downtown Hua Hin. Cross the railway tracks at Soi 70 or Chomsin Road, then take the first right about 200 meters onto 3218 Highway. This road will lead you to the temple. There are signposts along the road, so you won’t miss it.